KUNSTENISRAËL exists for 7.5 years now, and the press is taking notice. Earlier, a feature article about our research trips for curators appeared in the Jerusalem Post. Also, journalist Achsa Vissel interviewed KUNSTENISRAËL’s director Ken Gould. He gives an overview of the organisation’s impressive first years and a preview of the exciting plans for boosting Israeli arts in the Netherlands. 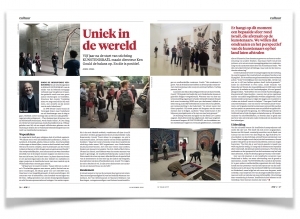 You can read the full article, which first appeared in the Dutch Jewish weekly ‘NIW’, here.